In this small village in the Isere region, the sun's first rays caress the hills and mountains, and light up the elegant facade of this French-style chateau. Built in 1760 by the Vivier Merle family, embellished with the addition of an orangery, the chateau's main building ends in a small tower each side with a spiked roof. This property delights by its overall harmony and layout. Today, after 7 years of renovation, the chateau has come into its own and found its former ageless nobility with wide spaces filled with light. The downstairs welcomes you with a huge entrance hall, and 3 reception rooms one after the other. Worth noting is the parquet in the large reception room, created by the carpenter Hache, in Louis XV style. An imposing wooden staircase with one turn leads to the upper floor. All 5 bedrooms and the bathrooms are spacious and discreetly decorated, and have views over the village or parkland. The last floor boasts 2 bedrooms each with an en-suite bathroom, a large office and has interesting possibilities for renovation projets. The chateau owns handsome, vaulted cellars just waiting to welcome you and your friends for wine tasting. The property is situated in 2,5 hectares of parkland with charming views of the village rooftops and church. Numerous trees are well established in the park (2 hundred year old cedars, oaks, red maples and wild cherries). To one side, the former outbuildings can be found, with a real chicken house and ancient washhouse. The current owners were bewitched by the property and have proved themselves worthy with their attention to detail and subtlety. The chateau is a warm host and beckons to you. 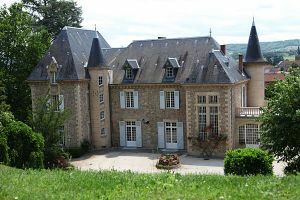 The asking price is 2 330 000 euros.